Hospitals, physicians and other health providers are experiencing the need to improve the services and skills they previously offered to meet the growing needs of tomorrow’s communities. This is a time when all of health care needs to crowd together to seek innovations and maximize the quality service provided to patients at all levels of care. At the core of every functional and efficient team is a stable leader who operates with integrity and determination. Keynote speakers Pat Day, Joe Pusateri and Christian Lillis have demonstrated this through the impressive achievements acquired over the course of their careers. 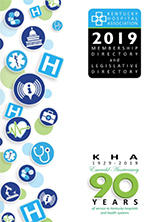 The Kentucky Hospital Association’s Annual Quality Conference will begin with an afternoon on Leadership, followed by a day dedicated to Falls and Infections, and ending with a discussion from various community partners. A quality race to improve patient outcomes is the strategy and goal to bring health care towards the final turn. Special thanks to our many sponsors for their support this year! Please visit with them during the conference.